The Costa Classica, built by Fincantieri. The growth of cruise passen-ger shipping, thought by some industry analysts in 1980s to be short-lived, has main- tained its strong pace for over a decade. According to statistics re- leased by the Cruise Lines Interna- tional Association (CLIA), which represents 35 major cruise opera- tors (about 95 percent of the capac- ity operating out of North America), the cruise shipping market has ex- perienced an annual growth rate of 9.8 percent since 1980. Over the same period, capacity has risen by an annual rate of 8.3 percent. CLIA projects passenger shipping to increase by a whopping 12.1 per- cent in 1992 and an additional 7.8 percent in 1993. 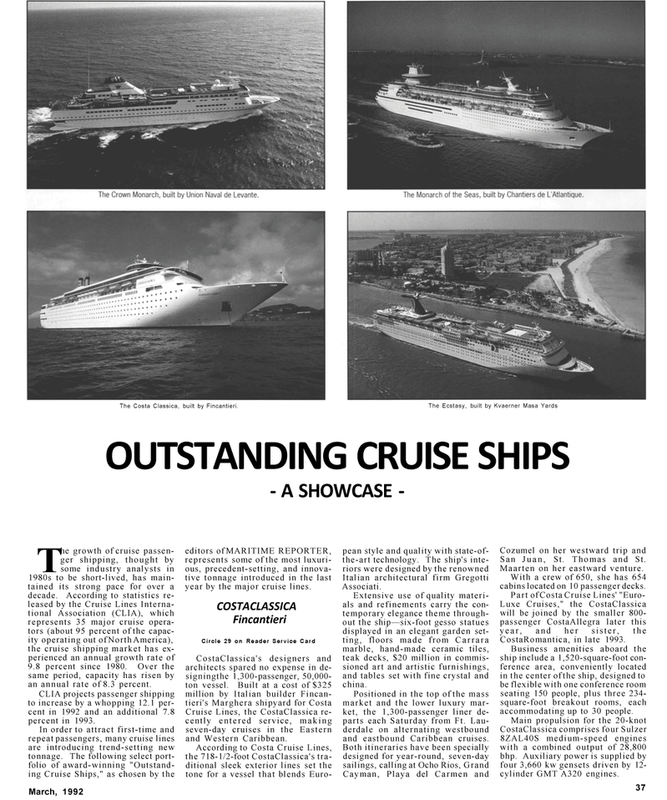 March, 1992 editors of MARITIME REPORTER, represents some of the most luxuri- ous, precedent-setting, and innova- tive tonnage introduced in the last year by the major cruise lines. Cruise Lines, the CostaClassica re- cently entered service, making seven-day cruises in the Eastern and Western Caribbean. Extensive use of quality materi- als and refinements carry the con- temporary elegance theme through- out the ship—six-foot gesso statues displayed in an elegant garden set- ting, floors made from Carrara marble, hand-made ceramic tiles, teak decks, $20 million in commis- sioned art and artistic furnishings, and tables set with fine crystal and china. Positioned in the top of the mass market and the lower luxury mar- ket, the 1,300-passenger liner de- parts each Saturday from Ft. Lau- derdale on alternating westbound and eastbound Caribbean cruises. San Juan, St. Thomas and St.
Maarten on her eastward venture. With a crew of 650, she has 654 cabins located on 10 passenger decks. Business amenities aboard the ship include a 1,520-square-foot con- ference area, conveniently located in the center of the ship, designed to be flexible with one conference room seating 150 people, plus three 234- square-foot breakout rooms, each accommodating up to 30 people.